KANAZAWA, Japan, Feb. 6, 2019 /PRNewswire/ -- A strategy to invert the chirality of a metal-containing helical molecule controlling the speed of the response is reported in Chemistry, A European Journal by researchers at Kanazawa University. 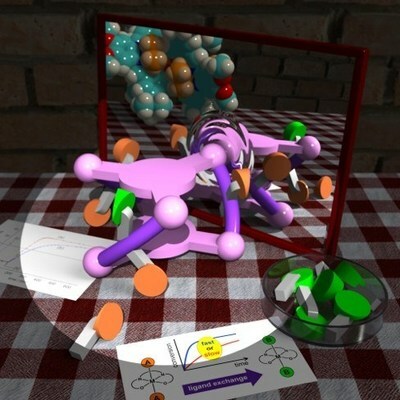 Chiral molecules cannot be superimposed on their mirror images – like hands. The two mirror images of a molecule, one right-handed, the other left-handed, are called enantiomers. Most molecules used in drugs are chiral, and only one enantiomer is effective (the other one can even be toxic), thus being able to control and manipulate the chirality of molecules is of foremost importance for a wide range of applications. Scheme 1 from the paper\Front cover of Chem. Eur. J. 10.1002/chem.201900297 showing the research by Shigehisa Akine et al. that is published in this issue. Nano Life Science Institute (NanoLSI), Kanazawa University is a research center established in 2017 as part of the World Premier International Research Center Initiative of the Ministry of Education, Culture, Sports, Science and Technology. The objective of this initiative is to form world-tier research centers. NanoLSI combines the foremost knowledge of bio-scanning probe microscopy to establish 'nano-endoscopic techniques' to directly image, analyze, and manipulate biomolecules for insights into mechanisms governing life phenomena such as diseases. As the leading comprehensive university on the Sea of Japan coast, Kanazawa University has contributed greatly to higher education and academic research in Japan since it was founded in 1949. The University has three colleges and 17 schools offering courses in subjects that include medicine, computer engineering, and humanities. The University is located on the coast of the Sea of Japan in Kanazawa – a city rich in history and culture. The city of Kanazawa has a highly respected intellectual profile since the time of the fiefdom (1598-1867). Kanazawa University is divided into two main campuses: Kakuma and Takaramachi for its approximately 10,200 students including 600 from overseas.